Sen. Bernie Sanders (I., Vt.) said on Saturday the Center for American Progress and its affiliated blog ThinkProgress were a "counterproductive" force in the effort to beat President Donald Trump, an attack against a liberal think tank his top campaign officials were previously affiliated with. 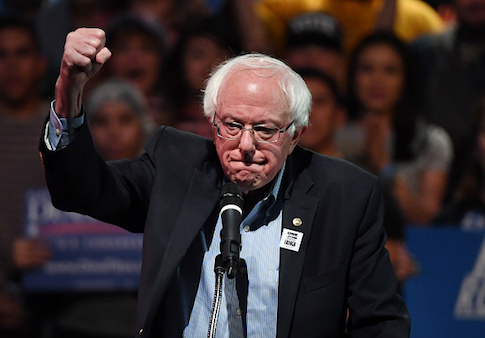 Sanders' "deep concern and disappointment" in the group was expressed in a Saturday letter to Center for American Progress board members in which he complained about what he called "personal attacks" and efforts to "smear" him and other 2020 candidates. The letter, published by the New York Times, was emailed to the liberal group by Sanders campaign manager Faiz Shakir, who launched the ThinkProgress blog and served as its editor in chief. Also previously employed by the Center for American Progress was the campaign's top foreign policy adviser Matt Duss, who was the liberal think-tank's Middle East director and a frequent byline on Think Progress. Center for American Progress president Neera Tanden, a frequent critic of Sanders supporters who is called out directly in the Sanders letter, responded by asking for a meeting with Shakir to discuss the "unfortunate" situation. Sanders said in the letter he will be informing his "grassroots supporters" about his issues with the Center for American Progress, but would be willing to reconsider if the group's "actions evolve." Sanders criticized both recent articles published by the think-tank and also the corporate money the organization receives, raising the possibility that donors are "influencing the role it is playing in the progressive movement." The article that most directly led to the letter from Sanders labeled him a "millionaire" and "one-percenter." The blog also produced a video on his "millionaire problem," arguing that his attacks on the rich have been watered down as his own wealth increased. "Last week, you published an article on ThinkProgress criticizing me for my appearance and for the income I earned from writing a book," he wrote. "Then, a day later, you published a video that dishonestly attacked me for hypocrisy in my effort to address income inequality in America—a video that was excitedly discussed on many conservative websites." Sanders also complains about attacks on Sens. Elizabeth Warren (D., Mass.) and Cory Booker (D., N.J.) that he viewed as unfair. "This counterproductive negative campaigning needs to stop," he writes. "The Democratic primary must be a campaign of ideas, not of bad faith smears. Please help play a constructive role in the effort to defeat Donald Trump." The Center for American Progress was founded by John Podesta, who chaired Hillary Clinton's failed 2016 campaign. It is funded by both large corporate donors and also liberal billionaires such as George Soros. This entry was posted in Politics and tagged Bernie Sanders, ThinkProgress. Bookmark the permalink.